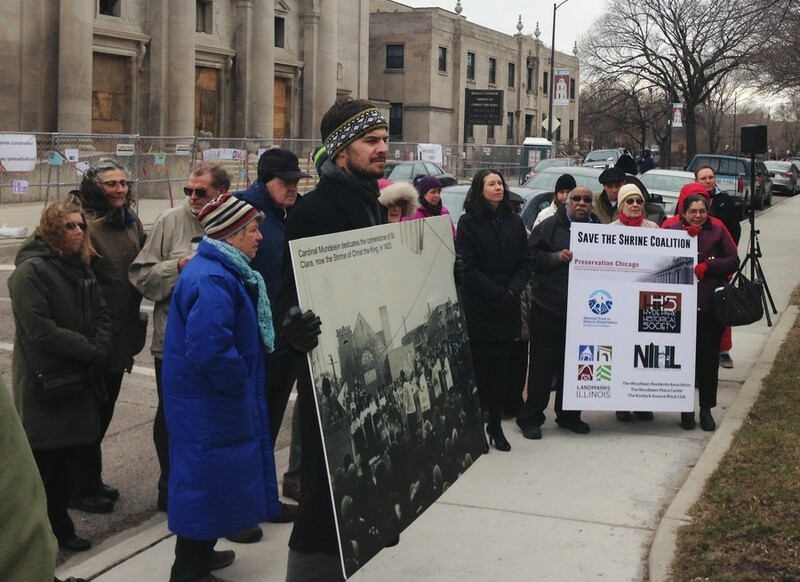 Members of the Save the Shrine Coalition protest the plan to demolish Shrine of Christ the King Church on 64th and Woodlawn. Preservation Chicago, an organization that works to preserve historic sites throughout Chicago, announced at a press conference yesterday that it had received enough donations to stabilize the Shrine of Christ the King church. Located on 64th Street and Woodlawn Avenue, the church was declared hazardous after a fire last October. $450,000 of donations were pledged anonymously to repair the building and make it safe, but more funds would be required for a full-scale restoration. Community and parish members have been working to raise money and awareness in hopes of stalling the destruction of the church since the Archdiocese of Chicago filed for a demolition permit last month. The Coalition to Save the Shrine is a grassroots organization of local citizens working to save the 92-year-old church. Along with a number of local and national preservationist groups, it has been advocating for the stabilization of the building to provide more time to examine alternative solutions. According to Ward Miller, executive director of Preservation Chicago, a handful of donors gave most of the $450,000, and would be willing to give more if necessary. The Archdiocese has yet to announce any plans to withdraw its application for demolition, but says that it is looking forward to hearing Preservation Chicago’s proposal. “We continue to be guided by the safety concerns expressed by the City of Chicago and the engineers who reviewed the building after the fire, and we will continue to work with the Institute of Christ the King as we consider options for the future of the shrine property,” Susan Burritt, spokesperson for the Archdiocese, said. The building has been on the brink of demolition before. In 2003, the church, which was then St. Gelasius, was declared a landmark by the Landmarks Commission right before it was supposed to be torn down. The building was then restored and the Institute of Christ the King, a Catholic religious group, began to use the church. “Landmarks mean a lot to all of us collectively as citizens of the City of Chicago. When they’re destroyed, it destroys part of our culture and architectural heritage,” Miller said. Although the fate of the Shrine is still uncertain, the Coalition and its partners are optimistic about the future. “I hope that the Archdiocese will see the spirit here at work—the spirit of faith, hope, and love,” Jack Spicer, chair of the Preservation Committee of the Hyde Park Historical Society, said.